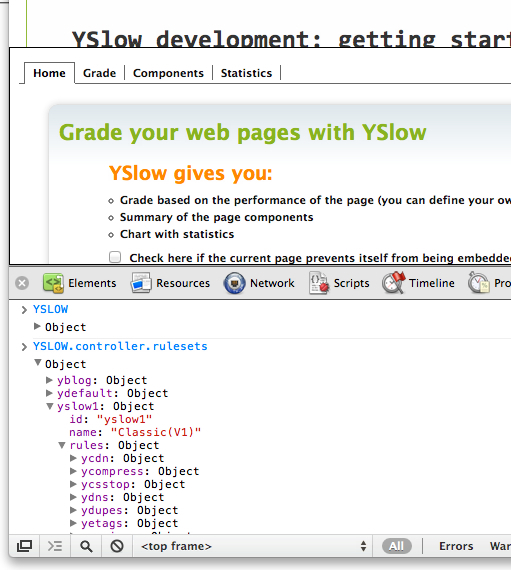 As promised, let's setup for YSlow development using the easiest option - the bookmarklet version. The journey of conquering the world with your rules and extensions... starts with the first step. First you need to get teh codez. Go to the Github repository and click that big ol' Fork button. Then checkout the repository somewhere. For this next step you need make. Good luck if you're on Windows. On Mac, seems like the most "blessed" version you can by installing this package called Command Line Tools for Xcode. Which (I'm not sure but probably) also requires Xcode. Xcode in the App Store. It's about 1.5GB. You go, I'll wait. In the top directory of the code you've downloaded, there's a readme and /src (where it gets interesting) and a Makefile. But. Not yet. First things first. The bookmarklet consists of one largish JS file and one smallish CSS. The bookmark that you'll click in the browser will load the JS file. Then the JS needs to know where to find the CSS. So you need a big of config. If you look in /src/bookmarklet you'll see some config-*.js files. You need a new one for you too. Let's say you'll host the bookmarklet at http://www.phpied.com/files/yslow. If you've already installed the YSlow bookmarklet in your browser, you can go and edit the location of the JS file. If not, visit http://yslow.org/mobile for the instructions. All you need to do is change yslow.org to your location, e.g. phpied.com/files/yslow. It works so well that you even need to look at a network analyzer to believe it's really using your own hosted version. 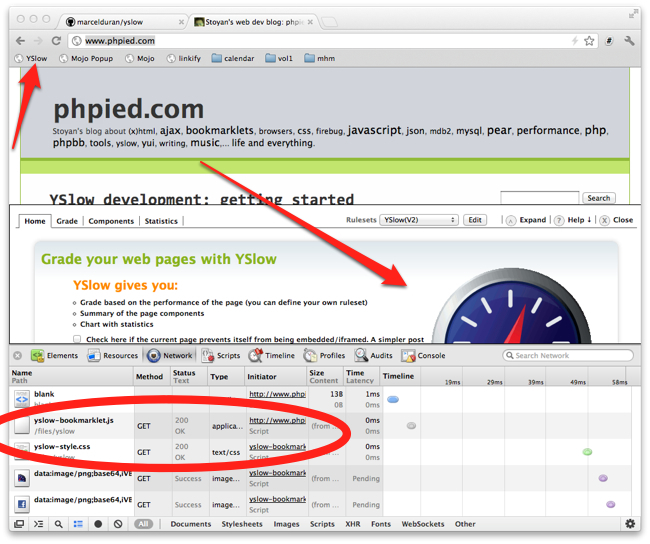 YSlow takes extra care to run unobtrusively to the page. In an iframe, not leaving any globals behind. Meh, I want to play in the console. So I want to access the two globals: YUI and YSLOW. Let's see how you add your codes to YSlow. That's as good an exercise as any. You know YSlow bookmarklet runs in an iframe, so we want to expose the iframe's two globals to the parent.